Shaikh Jaber Al Ahmed Cultural Centre ... centrepiece. A new cultural district is taking shape at Flag Square in Kuwait City, which has been designed to give a whole new dimension to such facilities in the entire GCC region. Being developed by the Amiri Diwan, the district will comprise the Sheikh Jaber Al Ahmad Cultural Centre, Shaikh Abdullah Cultural Centre and the Al Salam Museum, which will boast state-of-the-art theatres, concert halls, cinemas, conference and exhibition halls, a library, and museums. The three distinctive facilities – representing the past with Al Salam Palace, the present with Sheikh Jaber Al Ahmad Cultural Centre and the future with Sheikh Abdullah Al Jaber Cultural Centre – are under construction. 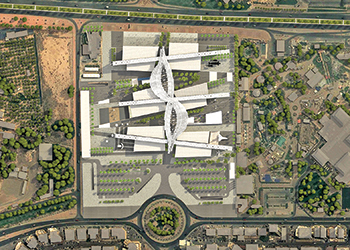 The centrepiece of the district is the Sheikh Jaber Al Ahmad Cultural Centre, which is unique in many ways incorporating imposing features to match those of the Opera House in Sydney, Australia, says a spokesman for SSH, the consultant on the project. The huge centre is being built over a 240,000-sq-m site under a 16-month fast-track design-and-build contract and, on completion, will feature four buildings housing a national theatre, music centre, conference complex and historical documents and library centre. The buildings will be accessed from spacious entrance courtyards and will “sit like jewels within a large public park”. The cultural centre will comprise a national theatre building with 2,000 seats (nearly the same as capacity as the Royal Opera House in the UK), a drama theatre with 770 seats (the same as Apollo theatre in London), a studio theatre and a car-park with 4,000 spaces. It also includes a music centre comprising concert and recital halls, a conference centre featuring a multi-purpose hall, exhibition hall, cinema and symposium areas, and the national library and historical documents centre. The concert hall at Shaikh Jaber Al Ahmad Cultural Centre ... stunning. “No stone has been left unturned to create this marvel,” says Sebaa Orabi, head of discipline, interior design, at SSH. The finest architecture style will be matched by state-of-the-art interiors created using the highest quality materials; sophisticated materials, systems and construction techniques to ensure the cutting-edge acoustics that underpin the success of a world-class cultural centre, she adds. Thousands of square metres of calligraphy will be engraved on the buildings’ walls while sustainability has been built into some of the features of the centre. 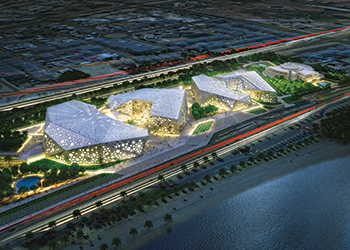 Sheikh Jaber Al Ahmad Cultural Centre is designed to showcase the performing arts and create a world-class theatre quarter in a spacious parkland setting. Complex geometric forms inspired by Islamic architecture will create the richly textured outer skin of each building that is clad in titanium and this will result in dramatic public spaces below that benefit from the interplay of light and shadow, she explains. “Below these striking outer skins, the building will exude character, drama and a heightened sense of expectation, with each building continuing to surprise with its beautifully designed interiors,” Orabi says. The project is being procured on a design-and-build basis by Al Hani Construction and Trading Company, which has enlisted SSH to provide design services. commence shortly for completion by February 2016. “Being a design-and-build project, the overlap between the design and build periods allows for flexibility and design enhancement in procurement,” says Orabi. “For example, we suggested seating options in 2014, but were able to specify new models that came out in 2015 when we visited Milan Furniture Fair. Recital hall ... excellent acoustic levels. “Interior design and FF&E (furniture, fittings and equipment) selection reflects the psychology behind the design concept of each project. The colour pattern throughout these projects is monochromatic in circulation and main foyer areas, with interesting Arabic calligraphy in carved slabs of marble and cast metal. As you go inside the ‘skin’ of the buildings, the richness and saturation of colours and materiality allows each room to be represented in its own unique way. Among the distinctive features of the four buildings is the use of black marble and the pervasiveness of calligraphy – there will be more than 8,000 sq m of calligraphy designed into the cladding of the theatres, concert halls and libraries. Kuwaiti calligrapher Jassim Nasrallah holds credit for work on the theatre and library, whilst the Tunisian El Seed is responsible for work on the music centre. Seven stanzas that echo the Amir’s own sayings on culture and development have been selected for the theatre and music centre. Hand-made, sculptural characters in cast aluminium are etched on the black marble of the theatres, while an entirely different approach is adopted for the music centre, where the deep blue marble is ‘veiled’ by a glass curtain-wall that is decorated with a calligraphy interlayer, standing 16 m tall and spanning 93 m.
The main concert hall of the music centre is decorated with champagne gold panels, decorated with a geometric abstract calligraphy design. Finally, the library and archive building is clad with 2-by-2-m stone panels featuring a geometric calligraphy pattern and a polished and hand-carved negative relief in bush-hammered natural stone. These panels decorate key areas of the elevation adjacent to the entrances. Rather than pure cladding, this has been “a successful attempt to create an 8,000-sq-m work of local art, fit for the four jewels”, says Orabi. 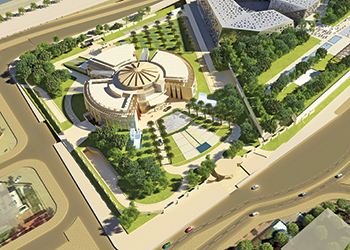 Shaikh Abdullah Cultural Centre ... overview. Another highlight is the monolithic signature lighting feature hung within the entrance foyer of the national theatre and spanning between the outer walls of two other theatres. Drawing an analogy between glass and water, the lighting is presented as a tiered array of “falling glass” to evoke the impression of a giant indoor waterfall that visitors can walk around, pass under or walk behind at balcony levels, Orabi elaborates. Orabi says that for special occasions, a colour wash or special show will play in and around the waterfall through carefully programmed video mapping and media content projected over the surface of the chandelier. A number of features have been built into the theatres and recital halls to ensure optimum acoustic levels for the performances they are intended to host. For instance, the national theatre has variable acoustics, and has been designed to provide a reverberation time of around 1 to 1.2 seconds for musical performances and speech-based drama. It has retractable acoustic drapes and banners to increase the reverberation time up to 1.3 to 1.5 seconds for use with amplified opera (modern opera). The balcony fronts and overhead reflectors have been angled to maximise sound reflections to the rear of the auditorium to help provide an immersive experience for all the audience. The specified maximum background noise level for building services noise is NR20. The auditorium envelope has been designed to provide high levels of sound insulation of at least DnTw (airborne sound transmission) 65 dB using in-situ concrete walls and lobbied doors throughout. The seats in the first few rows are fixed on lift wagons that can be stored below and a platform for the orchestra pit can rise to below seating level. This allows the performance to include an orchestra, if needed. 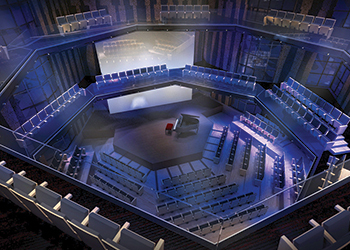 The 700-seat drama theatre has fixed acoustics and is designed for speech-based performance and musical theatre with a reverberation time of less than 1.1 seconds. Al Salam Museum... will portray Kuwait’s past. 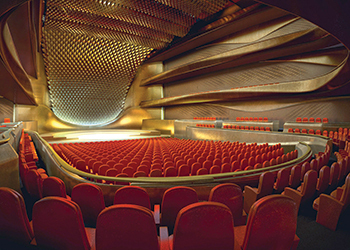 The concert hall, which boasts 1,500 seats, features variable acoustics, provided with the use of hidden acoustic banners and inflatable baffles. When the banners and baffles are retracted, the hall is designed for orchestral music with a reverberation time of 1.8 to 2.2 seconds. The stage has mechanical stage risers with a solid timber platform to act as a sounding board for orchestras. Overhead stage reflectors and the stage side walls are designed to ensure ease of hearing between orchestra members. When the acoustic banners and baffles are employed, the reverberation time will reduce to less than 1.4 seconds to provide conditions suitable for jazz or big-band performances. The specified maximum background noise level for building services noise is NR15. The auditorium envelope is designed to provide high levels of sound insulation of at least DnTw 65 dB with access via lobbied corridors and a high-performance double-glazed window at the rear. The conference centre, meanwhile, includes a flexible multifunction hall with various seating configurations, such as flat floor seating (540 seats) for conferences, tiered seating (540 seats) for theatre, 140 seats for classroom configurations, 240 seats for banquets, and 540 seats for exhibitions. Acoustically, the walls and ceiling of the multipurpose hall have been treated to provide reverberation times between 1.5 to two seconds for large conferences and functions with speech reinforcement and amplified music. Its foldable fixed seats on wagon platforms can be raised on guiding rails integrated within the wall finish to transform the flat floor space to tiered theatre seating. The ceiling has a tension wire grid that can accommodate different production equipment, such as lighting and/or hanging exhibits. Dynamic automated chandeliers fold into the wire-grid zone and retract in banquet and cabaret functions. The specified maximum background noise level for building services noise is NR30. The envelope has been designed to provide high levels of sound insulation of at least DnTw 65 dB with lobbied doors throughout. The historical document centre and library also features a multipurpose and temporary exhibition areas. SSH is one of the leading masterplanning, infrastructure, building design, construction supervision and project management firms in the Middle East, with a reputation for design integrity and a portfolio that includes landmark projects throughout the region. The firm maintains offices in Kuwait, Oman, Qatar, UAE, Iraq, Bahrain, Algeria, South Africa and London. Founded in 1961, it has completed more than 1,000 projects, is ranked third architecture company in the Middle East and amongst the top 100 Architects in the world by World Architecture Magazine.